This week, comments from guest blogger and International Space Station Associate Program Scientist Tara Ruttley, Ph.D., as she reflects on the physical science of boiling in space. If you don’t think of yourself as the type of person who could ever be interested in physics, let’s boil this down. You’re hungry. It’s pasta time. Your pot of water is on the stove, you’ve turned on the maximum heat, and the wait for boiling begins. You are staring impatiently at the pot when the water looks like it’s starting to swirl. You’re anxious to see the bubbles that signify that you can put your pasta into that water. But what do those bubbles tell you and what makes them the key indicator of perfect pasta water temperature? On Earth, water boils via natural convection. To simplify a bit, boiling is actually a very efficient heat transfer process and, in this case, boiling transfers the heat from the fire on your stove to the water that will cook your pasta. It seems straight-forward enough here on Earth: you turn on the burner, wait a few minutes, and when all those small bubbles appear, you’re ready to get cooking. As you wait for your pot of water to boil, there is a complex process going on in there. First, the liquid on the bottom of the pot closest to the heat source starts to get hot; as it does, it rises. 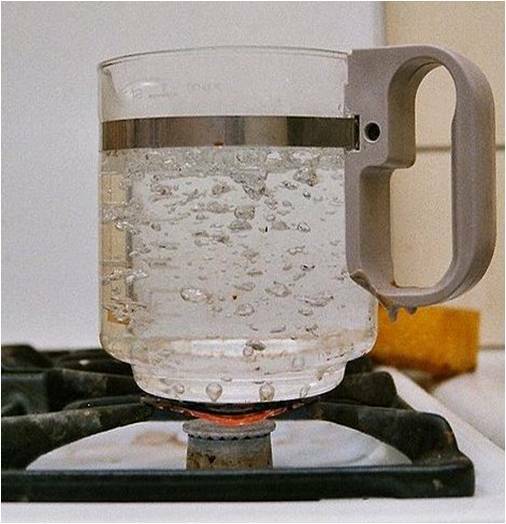 The rising hot water is replaced by the cooler, more dense water molecules. The water molecules in your pot continually exchange in this way, thanks to gravity, eventually warming the entire pot of liquid. This is known as natural convection—the movement of molecules through fluid—which is a primary method of heat (and mass) transfer. behave quite differently in space. But natural convection is not enough, as it does not yet provide those bubbles you need for your pasta. To get those bubbles, you have to wait long enough for the bottom of the pot to get hotter than the boiling point of the water. When the boiling point is breached, you finally begin to see the tiny bubbles of water vapor you’ve been waiting for! The bubbles rise, due to buoyancy, and then collapse as they reach the denser, relatively cooler water at the surface of the pot. This motion not only helps to move the water around more quickly (think stirring), but the bubbles themselves transfer heat energy as well. This bubble formation is called nucleate boiling; a far more effective way to transfer heat than natural convection on its own. In fact, so effective that ultimately it leads to more complex boiling called transition boiling—the highly turbulent bubble flow that indicates the water is now hot enough to cook your pasta. In space, however, bubbles behave differently. Without gravity, the effects of buoyancy and convection are absent. The warmer water cannot rise; instead it remains near the heat source, getting hotter and hotter. Meanwhile, the remaining water further away from the heat source stays relatively cool. As the heated fluid reaches its boiling point, the bubbles do not rise to the surface. Instead, the bubbles that do form coalesce into one large bubble that sits on the heated surface. Within the bubble lies precious heat energy, trapped! The result is a seemingly inefficient or at least very different, way to transfer heat. regions of low heat transfer. As it turns out, there are plenty of scientists out there who are fascinated with the fact that if you boil water in space, you get one large bubble that tends to “swallow” smaller bubbles. Why the fascination? Well, beyond the gains in fundamental thermodynamics “textbook” knowledge, because boiling is such an effective heat transfer process, understanding more about this complex process can help to build more efficient cooling systems for Earth and space. For example, automotive engineers are interested in designing compact, energy-efficient systems to cool off hot car engines, based on the heat transfer mechanics of boiling. In fact, your own refrigerator uses a coolant with a low boiling point and some associated pressure changes in order to keep your food cold inside. By transferring heat from the fridge air to the coolant to the point of boiling, heat ultimately dissipates from the bubbles and radiates out into the air in your home. In essence, although the air inside of your fridge may seem cold to you, it is actually warm enough to boil its coolant, which is the very heat transfer process responsible for keeping your food cold. The Boiling Experiment Facility or BXF, which launched on STS-133 in February 2010, will enable scientists to perform in-depth studies of the complexities involved in bubble formation as a result of heat transfer. For instance, what roles do surface tension and evaporation play during nucleate boiling when buoyancy and convection are not in the equation? What about the variations in the properties of the heating surface? By controlling for gravity while on the International Space Station, scientists can investigate the various elements of boiling, thus potentially driving improved cooling system designs. Improved efficiency in cooling technology can lead to positive impacts on the global economy and environment; two hot topics that have much to gain from boiling in space. 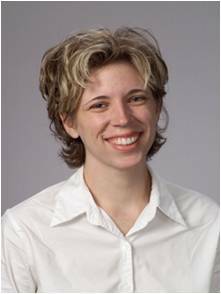 Dr. Tara Ruttley is an Associate Program Scientist for the International Space Station (ISS) for the National Aeronautics and Space Administration (NASA) at Johnson Space Center (JSC) in Houston. Her role in the Program Science Office consists of representing and communicating all research on the space station, and supporting recommendations to the ISS Program Manager and to NASA Headquarters, regarding research on the ISS. Prior to her role in the ISS Program Science Office, Dr. Ruttley served as the lead flight hardware engineer for the ISS Health Maintenance System, and later for the ISS Human Research Facility. She has a Bachelor of Science degree in Biology and a Master of Science degree in Mechanical Engineering from Colorado State University, and a Doctor of Philosophy degree in Neuroscience from the University of Texas Medical Branch. Dr. Ruttley has authored publications ranging from hardware design to neurological science, and also holds a U.S. utility patent. The STS-133 shuttle flight, which launched to the International Space Station on February 24, 2011, includes 5 investigations for crewmembers to perform, delivery of 24 studies with hardware or samples, and 22 investigations with samples or data coming home on the return trip. Allow me to share with you a few of the highlights from this extensive list. A major milestone from this flight is the final outfitting of the interior of the space station laboratory. NASA launched the last of the Express Racks on STS-133. These workhorses are bench-like structures used to support experiment equipment with power, data, and thermal sensors. The final addition of Express Rack 8 completes the furnishing of the laboratory, making way for full use of the station for research. Future National Lab users will employ about 50 percent of the space available in these racks, doing research that will benefit discovery and economic development of the nation through 2020 and beyond. This flight also includes a unique experiment that will study the very puzzling effects of spaceflight on the immune system. The Effect of Space Flight on Innate Immunity to Respiratory Viral Infections investigation looks at the impact of microgravity on the immune system by challenging it with respiratory syncytial virus (RSV). These studies will help determine the biological significance of space flight-induced changes in immune responses, which astronauts experience in microgravity. NASA and the National Institutes of Health (NIH) are both interested in using the space station to understand the immune system for astronauts and for the health of people here on Earth. The first premier boiling facility, the Boiling eXperiment Facility (BXF) also launched on STS-133. This equipment enables the study of boiling in space, paving the way for two new investigations to take place on station: Microheater Array Boiling Experiment (BXF-MABE) and Nucleate Pool Boiling Experiment (BXF-NPBX). The boiling process is really different in space, since the vapor phase of a boiling liquid does not rise via buoyancy. Spacecraft and Earth-based systems use boiling to efficiently remove large amounts of heat by generating vapor from liquid. For example, many power plants use this process to generate electricity. An upper limit, called the critical heat flux, exists where the heater is covered with so much vapor that liquid supply to the heater begins to decrease. The goal of BXF-MABE is to determine the critical heat flux during boiling in microgravity. This will facilitate the optimal design of cooling systems on Earth, as well as in space exploration vehicles. Without buoyancy or convection, boiling fluids behave quite differently in space. 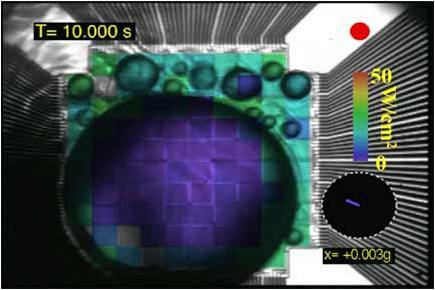 The second experiment, BXF-NPBX, studies nucleate boiling, which is bubble growth from a heated surface and the subsequent detachment of the bubble to a cooler surrounding liquid. Bubbles in microgravity grow to different sizes than on Earth and can transfer energy through fluid flow. The BXF-NPBX investigation provides an understanding of the heat transfer and vapor removal processes that take place during nucleate boiling in microgravity. This knowledge is necessary for optimum design and safe operation of heat exchange equipment that uses nucleate boiling as a way to transfer heat in extreme environments, like the deep ocean for submarines and microgravity for spacecraft. Also on this flight are some great new combustion experiments. Burning and Suppression of Solids (BASS) tests the hypothesis that materials in microgravity burn as well, if not better than, the same material in normal gravity, all other conditions being identical. Structure and Liftoff In Combustion Experiment (SLICE) investigates the characteristics of flame structure, such as length and lift, using different fuels with varied levels of dilution. SLICE uses a small flow duct with an igniter and nozzle to collect data as a flame detaches from the nozzle and stabilizes at a downstream position. Combustion is dramatically different in space, as seen in the photo below. These studies aim to make spacecraft safer from fires and combustion processes more efficient in microgravity. 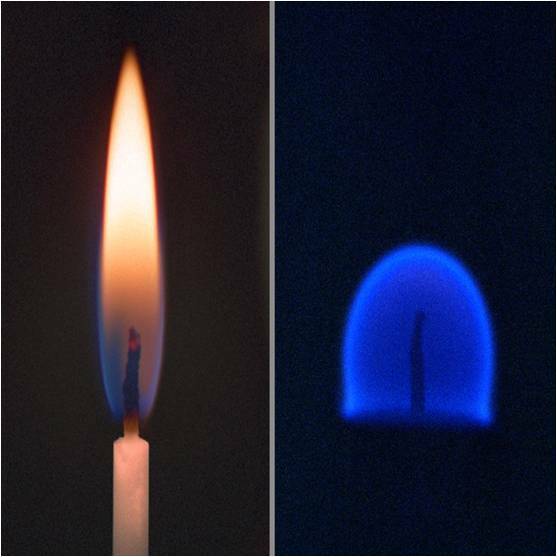 A flame in Earth’s gravity (left) vs. microgravity (right). flame is blue-hot and spherical. 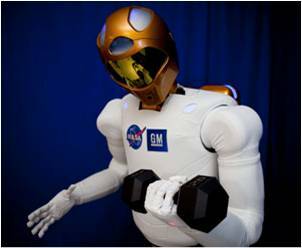 One of the more publicized technology demonstrations on STS-133 is a humanoid robot that seems like something right out of a sci-fi movie. Robonaut serves as a springboard to help evolve new robotic capabilities in space. Over the next few years, tests of this technology on the space station will demonstrate that a dexterous robot can launch and operate in a space vehicle, manipulate mechanisms in a microgravity environment, function for extended duration within the space environment, assist with tasks, and eventually interact with the crewmembers. The current Robonaut iteration: Robonaut 2. I am eager to see the results from the various studies beginning, ongoing, and returning from the space station via STS-133. This is an exciting time of full utilization of our laboratory in low Earth orbit! For a full list of experiments available on this flight, see the STS-133 Press kit or visit https://www.nasa.gov. This week, comments from guest blogger and International Space StationNational Laboratory Manager Marybeth Edeen, as she reflects on ways to helpresearchers reduce the time from concept to implementation for space stationexperiments. Have you ever heard complaints about how long it takes tofly investigations in space? There has been a lot of discussion about how longit takes to get research from concept to implementation. Numerous people willtell you that it cannot be done in under 1 year or even as long as 5 years. Withrecent changes put in place with the National Laboratory Office, however, we havebeen successful in getting payloads from concept to implementation in as littleas 6 months. The National Laboratory Office guides payload developers througha feasibility process to evaluate research ideas to determine how quickly thestation could accommodate a given payload. The first step is a triage meeting,where the research team and the payloads office experts discuss a concept todetermine the complexity of the research. Depending on the intricacy, we canguide the developers to use systems that are already in place, which cansignificantly speed up getting the research aboard the station. In many cases,we are able to slip the developer payload into a prepared research plan, using placeholderswe have prepared in advance. The research plan placeholders have certain capabilities(e.g., size, weight, etc.) set aside to reserve predefined spots for payloads.This way, when the time comes, we can determine which new payloads fit into theplaceholders. Additionally, the Payloads Office has a “lean process,”which enables payloads to go through the integration process and be put onorbit ready for operations in as little as 6 to 7 months; from the time it wasidentified as available for launch. The National Laboratory Office sponsoredsome payloads that went into orbit in as little as 6 months, but that is notthe norm at this time. A developer is already in the assembly process on theirend for the payload, rather than in the development stage of their idea. Anamazing turnaround like this is for known re-flight science, not for newpayloads being assembled. What we are trying to do with National Lab is to use theprocesses and manage the integration in such a way that we can bring things inlater than the normal flow. This is contingent on the National Laboratory modelof the commercial or government agency having their funding and developmentready to bring to the table. If they are waiting for anticipated funds to moveforward with development, this significantly delays the progress. School in San Jose, CA. One such developer who succeeded in an accelerated timelinewas the NanoRacks-CubeLabs team. The proposal for this commercially sponsoredpayload was submitted in July of 2009. A Space Act Agreement was signed inSeptember and by December of the same year, they had hardware delivered to the KSCfor launch. The developer team had already gone into the design work beforeapproaching NASA, but had not built the hardware at that point. They enteredhardware production in parallel with the integration process in order to getthe hardware certified for flight by December. On our side, the National Laboratory Office is trying toshorten the templates and build flexibility into the process. We want to enabledevelopers to determine their final plan later in the process, when necessary.There are only so many payloads you can run through the process this way,however, to avoid delaying the details of the planning for everyone involved. Wehave to prepare our research plans 18 months in advance, so we look at this andsay: “hmm, there are three guys wanting this type of experiment, let’s toss in aplaceholder for that” or “this group has been talking to us frequently, hastheir funding lined up, and seems pretty serious.” We are trying to identifyand create spots for payloads that are likely to show up in 18 months ready togo. Rather than advertising these placeholders, we try to identify them andfill them according to the interest we see on the horizon. We take an educatedguess when creating these placeholders to prepare for our research ahead. On the NationalLaboratory Web page, under Key Resources, payload developers can find theheading of Helpful Documents where our lean process documentation will post.We also posted the PayloadDevelopers and Principal Investigators Payload Planning, Integration andOperations Primer, so that researchers know what NASA needs from them atwhich times and why. This gives people an idea of what to bring to the tablebefore they talk to us, allowing them to move more swiftly through the process.This primer also cites changes for those using the lean process, to help savetime. More documents are continuing to post—some are still going through theapproval processes—so interested developers should continue to check back. Thislean process is new, so we are beta testing the documented process. Once we havebeen through it a few times, we can make changes and continue to improve it. The completion of ISS gives the crew a lot more time to workscience, so the faster we can get things up, the more science they can do. Also,there is more available upmass on the transport vehicles to transport resourcesfor experiments. It opens up more opportunities for our payload developers,especially if using existing hardware already on orbit. If you are interestedin doing research on station, give us a call. We are always open and lookingfor feedback in our processes to make them simpler and more user friendly forour researchers, so they can continue to get their results in a timely mannerand make great discoveries to benefit us all. Marybeth Edeen is themanager of the ISS National Lab Office. She has a B.S. in Chemical Engineering from the University of Texas andan M.S. in Chemical Engineering from Rice University. She has worked at NASA for 24 years. Thisweek’s guest blogger, Dr. Peter Boul, shares some of the exciting facilitydevelopments for the International Space Station National Laboratory with thereaders of A Lab Aloft. World-class research on the InternationalSpace Station would not be possible without a dedicated suite ofstate-of-the-art laboratory facilities and the project scientists that helpacademic researchers to use them. These are the resources that make experimentspossible and are invaluable to microgravity scientists. The LightMicroscopy Module (LMM) is a case-in-point for a state-of-the-art facilityenabling high-impact scientific research. This module features a lightmicroscope capable of supplying images of samples on the space stationmagnified by up to 100 times their actual size. 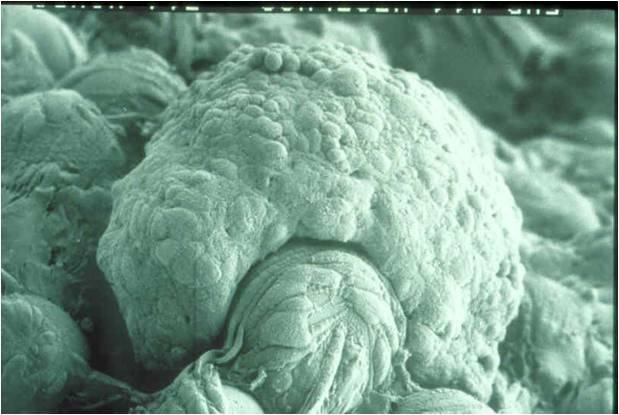 These images are digitallyprocessed and relayed back to Earth, where remote control of the microscoperesides. 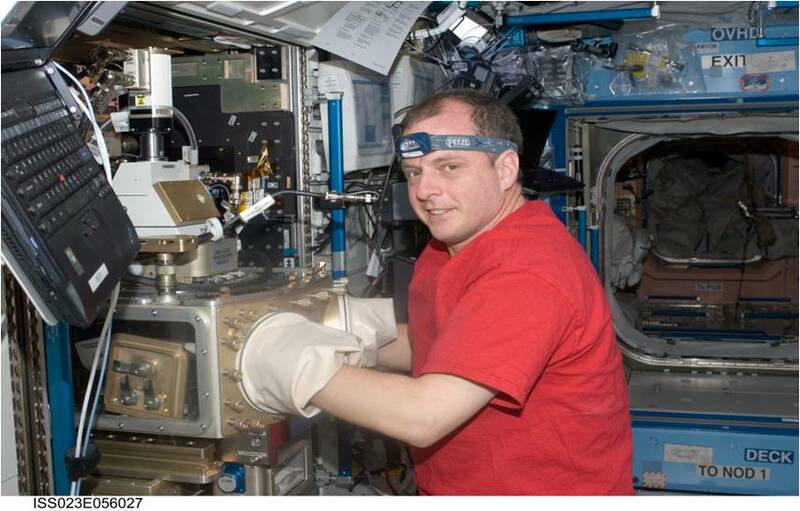 This allows flexible scheduling and control of physical science andbiological science experiments within the Fluids Integrated Rack or FIR on the spacestation. The present LMM will provide high-resolution images of samples andtheir evolution. In the near future, the LMM will produce 3-dimensional digitalimages, with the future addition of a confocal head for the microscope. or CVB investigation using the Light Microscopy Module. This 3-Dimage displays some LMM-ACE confocal imaging goals. The LMM concept is a modifiedcommercial research imaging light microscope with powerful diagnostic hardwareand interfaces. It creates a cutting edge facility that enables microgravityresearch at a microscopic level. 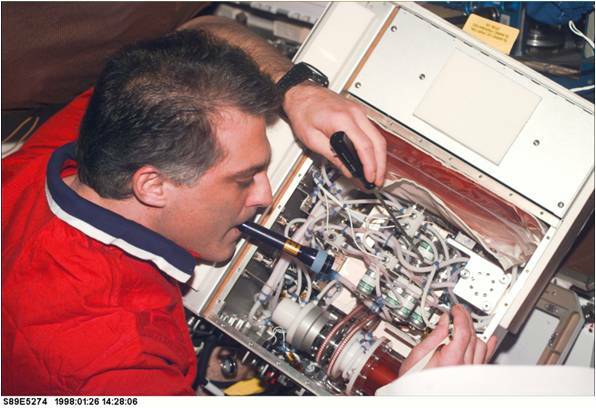 There are a variety of differentphysics, biology, and engineering experiments already scheduled to use the LMM.One such experiment, the Constrained Vapor Bubble experiment orCVB, is a jointcollaboration between NASA and Peter C. Wayner, Jr., Ph.D. of Rensselaer Polytechnic Institute. CVBinvestigates heat conductance in microgravity as a function of liquid volumeand heat flow rate to determine the heat transport process characteristics in acurved liquid film. The data from this experiment may help scientists andengineers develop reliable temperature and environmental control systems forinterplanetary travel. The information from CVB may also lead to improveddesigns of systems for cooling critical components in microelectronic devices hereon Earth. The LMM can also facilitate studies innanotechnology and nanomaterials. Understanding and predicting the forcesbetween nanoscale particles is critical in the design of nanoscale materials. Thescience community is interested in learning more about the forces that regulatemolecular machines, which are crafted for integrationinto new materials and new medicines. To this end, researchers such as Dr.David Weitz and Dr. Peter Lu with Harvard University, Dr. Paul Chaikin with NewYork University, Dr. Matthew Lynch with Proctor and Gamble, and Dr. Arjun Yodhwith the University of Pennsylvania, along with NASA Glenn Research Center areworking together to conduct a series of Advanced Colloids Experiments or ACE. 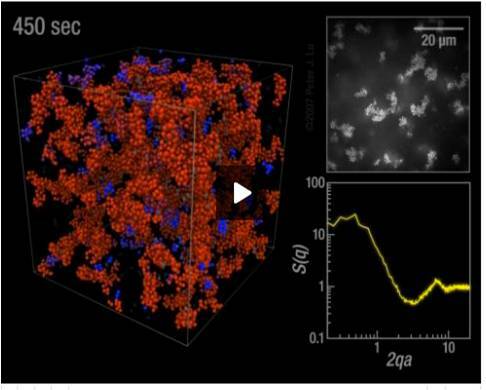 This investigation looks at howorder arises out of disorder, colloidal engineering, self-assembly, and phaseseparation. Some of the early microgravity colloids work demonstrated used modelingatoms with hard-sphere colloids to understand this idea of order arising fromdisorder. The ACE experiments may give scientists a better description of themagnitudes of the forces that operate on the nanoscale and how to control them.The potential applications from this work are vast and may apply to such topicsas the design of molecular and biomolecular machines, nanoelectromechanicalsystems, and methods for enhancing the shelf-life of medicines and foods. Using the LMM facility is just one wayin which an investigator can employ the station to pave a path to success in spaceresearch. Investigators now have a wide variety of instruments at theirdisposal on this orbiting laboratory. The outlook for the International SpaceStation National Laboratory is bright and ready to contribute to the next generationof great discoveries in science. The LMM is a fixed facility on the space station and is available for use forlaboratory experiments. National Laboratory investigators can use this facilitythrough agencies, such as the National Institutes of Health, the NationalScience Foundation, and the Department of Energy. Researchers who wish to seetheir experiments on the space station can find out how to take advantage ofthe opportunity to use facilities, such as the LMM, by visiting the NationalLaboratory For Researchers Webpage. For specific questions, contact the help line at281-244-6187 or e-mail jsc-iss-payloads-helpline@mail.nasa.gov. Dr.Peter Boul is the Physical Science and External Facilities Specialist in the InternationalSpace Station Program Scientist’s Office. He is an author to numerous patentsand peer-reviewed publications in nanotechnology. Dr. Boul earned his Ph.D. inchemistry under the tutelage of 1996 Nobel Laureate, Prof. Richard E. Smalley.Following his doctoral studies, he was granted a 2-year postdoctoral fellowshipfrom the French government to work with 1987 Nobel Laureate, Prof. Jean-MarieLehn, in dynamic materials. This week, comments from guest blogger,medical doctor, engineer, and astronaut, Dr. David Wolf, as he reflects on tissueengineering in space. The InternationalSpace Station National Laboratory has an edge for doing unique experiments inmedicine and biotechnology that are not possible anywhere else—we can “turnoff” gravity. As we gear up to fully use the station, the emerging field oftissue engineering is one of our high-value targets. This is a particularlypromising area of study where microgravity research has already made advancesin basic science. Indications are that further work will lead to importantapplications in clinical medicine on Earth. Building onthe groundwork from earlier programs, biotechnology research on the spacestation, and associated ground-based research in emulated microgravity, hascreated a large body of information. This data collection demonstrates thevalue of controlled gravity systems for assembling and growing 3-Dimensional livingtissue from individual cells and substrates. The NASA-developed Space Bioreactorprovides a core in-vitro capability both in space and on Earth. 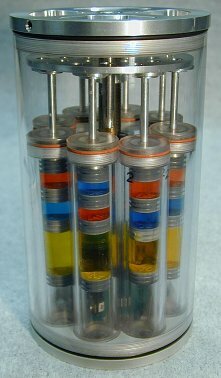 On Earth,these bioreactors are unique in that they are able to emulate, within limits,the far superior fluid mechanical conditions achieved in space. One may thinkof this Space Bioreactor as a 3-D petri plate. The core of the instrumentationis a rotating fluid filled cylinder, the culture vessel, producing conditionsinside resembling the buoyancy found within the womb. And much like in thehuman body, this vessel is surrounded by a life support system performing thefunctions of the heart and lung, achieving the precisely controlled conditionsnecessary for healthy tissue growth. The importance of this culturetechnique is that fluid mechanical conditions obtained in microgravity—and emulatedon Earth—allow the growth of tissues in the laboratory that cannot be grown anyother way. Emulated microgravity on Earth, and to a much greater degree, the actualmicrogravity of spaceflight enable an extremely gentle and quiescent fluiddynamic environment. The cells and substrates are free to organize into 3-Dtissues without the need to introduce disruptive suspension forces from bladesor stirring mechanisms. This leads to a broad array of applications based onenhanced in-vitro tissue culture techniques. Theground-based versions of the Space Bioreactor produced very high fidelity colontumors for cancer research, providing strong indications of the value of actualmicrogravity, see Figure 1. Even so, when I first put space grown tissuesamples under the microscope, while aboard the Space Station Mir, I wasastounded! In my many years of experience culturing tissues, I had never seenany so well organized, so healthy, and with such fine structure. Nerve derivedtissue from the adrenal gland was forming long fronds of exceptionally delicatetissue, see Figure 2. What I was seeing could never form on Earth, even in ourstate-of-the-art systems that emulate microgravity. in collaboration with Dr. Kim Jessup. in work conducted on Mir in collaboration with Dr. Peter Lelkes. 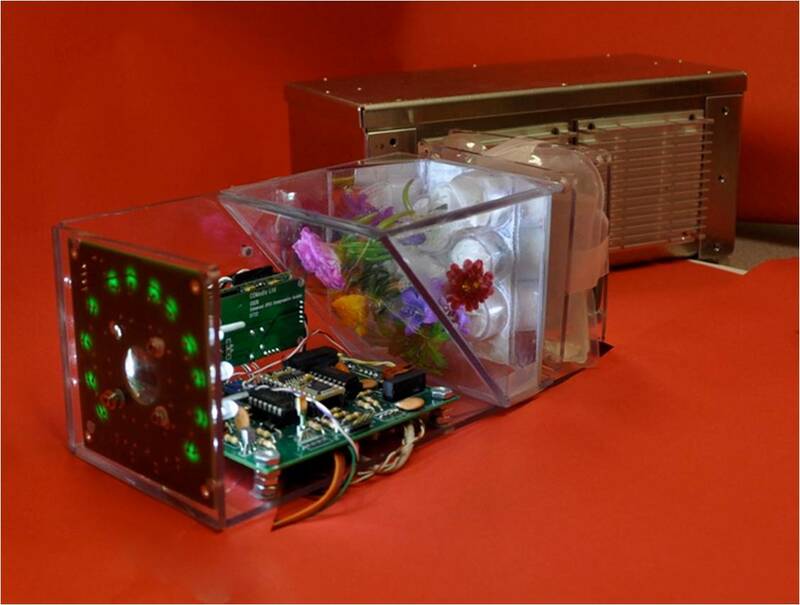 NASA researchin the Space Bioreactors produced over 25 U.S. patents and the technology isconsidered state-of-the-art for ground-based tissue culture. Scientists aroundthe globe from the National Institutes of Health or NIH, medical centers, and universitieshave produced numerous peer reviewed publications in highly respected journalsand even more patents based on the fundamental principles. Other actualspaceflight research has been successfully used to study breast cancer and prostatecancer. NASA has licensed its patents to spin-off companies including Synthecon, Inc., for commercialmanufacturing of the equipment, and Regenetech,Inc., for regenerative medicine and stem cell applications. These companieshave in turn sublicensed the technology even more broadly, enabling widespreaduse of this NASA-developed technology. Researchers onEarth use this technology to study cancer, stem cells, diabetes, cartilagegrowth, nerve growth, skin, kidney, liver, heart, blood vessels, infectiousdisease—virtually every tissue in the body. The applications go much furtherthan engineering implantable tissue, to include vaccine production and living ex-vivoorganic life support systems, such as artificial livers. Researchers at the NIH,for instance, used the methods to propagate the HIV virus, responsible forAIDS, in artificial lymph node tissue—itself sustained in the bioreactor. This resultedin the ability to study the virus life cycle under controlled conditions,outside the human body. But we arenot done. While very capable on Earth, the performance of Earth-boundbioreactors is still limited by the presence of gravity. Spaceflight testing onMir and the space shuttle demonstrate that the growth of larger, better functioning,and more organized tissue may be obtained under true low gravity conditions. Todate, the Space Bioreactor has been exploited primarily for basic research. Duringthe intervening time, the field of medicine has evolved a firm vision towardstrue regenerative tissue technology. In recent years, powerful molecular biologytechniques provided a detailed biological knowledge, which permits understandingcellular machinery almost like micro-machines. This convergence of technologywith the space station laboratory opens a new chapter for space biotechnology. The InternationalSpace Station National Laboratory now provides an unprecedented opportunity tothe biotechnology community. Within NASA, scientists continue to work to build theinfrastructure to enable the biotechnology community; to help them take thenext steps in exploiting controlled gravity in-vitro systems. The vision is toteam together the very best minds and institutions, leveraging their abilitiesto advance regenerative medicine. Such advances can lead to improving ourquality of life on Earth and serve as a lasting legacy of the space station era. Dr. David Wolf is anastronaut, medical doctor, and electrical engineer. Having traveled to spacefour times, Dr. Wolf participated in three short-duration space shuttlemissions and a long-duration mission to the Russian Space Station Mir. A nativeof Indianapolis, he participated in seven spacewalks, and the SLS-2 Life SciencesSpacelab Mission, logging over 4,040 hours in space. He received the NASAExceptional Engineering Achievement Medal, the NASA Inventor of the Year Award,among multiple recognitions for his work in advancing 3-D tissue engineeringtechnology. Over the past few years, scientists have identified majorchallenges in moving from research discoveries in biomedicine, to actualproducts that improve human health. This gap is called the “valley of death.” Thisterm derives from the perilous divide between research discoveries and medicaltreatments that become available to the general public. On one side of thevalley you find a new research result with important implications, on the otherside of the chasm stands a potential product capable of bettering or even savinghuman lives. In between these two milestones are numerous barriers that cankeep the knowledge from reaching its full potential for humanity. The redefined discipline of translational medicine seeksto improve the rate at which discoveries actually make it into the marketplaceor from “bench to bedside,” as seen in Traversing theValley of Death: A Guide to Assessing Prospects for Translational Success.The valley of death is so strewn with institutional and marketplace barriers,that experts believe we need to make changes in the support structure fortranslational research. By doing so, they hope that society will actuallyreceive the benefits of science investments. Nature published a news feature on this topic in 2008, titled TranslationalResearch: Crossing the Valley of Death. These challenges for Earthbound researchers also apply tothe biomedical research conducted on the International Space Station. Even themost compelling research findings on the space station have a long path aheadbefore that knowledge will have the opportunity to yield results—they, too, musttraverse the valley of death. Today, I want to share the status of three early researchfindings that you may have heard about. The results from these stationinvestigations are just now starting to make their way across the chasm. Thejourney for these results may take as long as two decades to complete, if theyare successful. Spaceflight causes increased pathogenicityin Salmonella bacteria, which is aknown cause of food poisoning. Investigators used space pathogenicity ofsalmonella infecting a model nematode (a type of worm used in research) as ascreening model to evaluate candidate vaccines. The resulting data are leading tothe development of a Food and Drug Administration application for aninvestigational new drug by Astrogenetix, Inc. A similar approach, usingmethicillin-resistant Staphylococcusaureus (MRSA), is also ongoing. Multiple research groups are nowinvestigating mechanisms of virulence in other species of bacteria. Theprogress of this research depends on the future success of several stages ofclinical trials, and the willingness of a pharmaceutical company to bring thevaccine to market. Given the global impact of food poisoning, the market islarge. Even so, it will still depend on a pharmaceutical partner presenting acompelling business case for completing the development. bacterial pathogens for virulence and therapeutic potential. 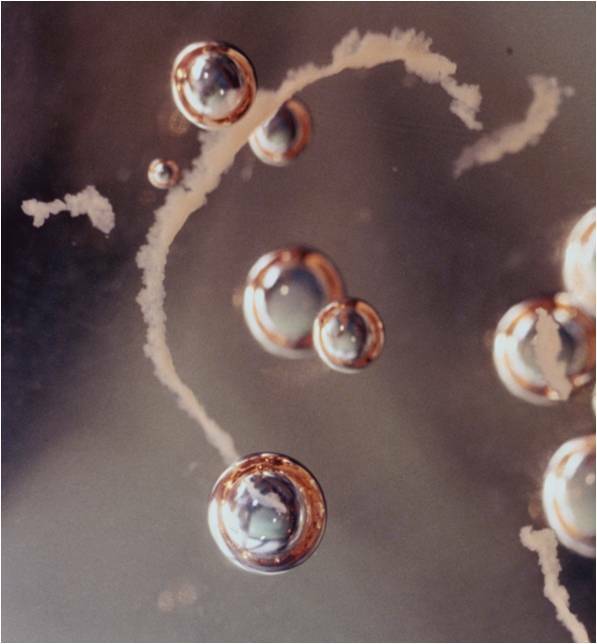 Microcapsules—micro-scale capsules surrounding aninjected medication to help it target a specific area of the body—were producedon the space station in 2002. 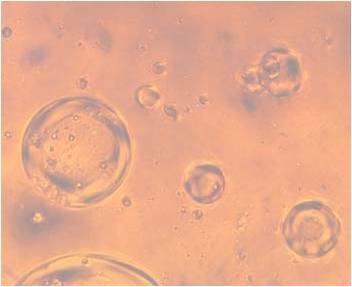 The properties of the space-producedmicrocapsules were predicted to be more effective in treating prostate cancer;this was shown in ground models. In 2009, researchers were finally able todevelop and patent a machine capable of producing quantities of similar microcapsuleson the ground. NuVue Technology is now trying to raise the money necessary tofund the FDA-approved clinical trials at M.D. Anderson Cancer Center in Houston, TX,and the Mayo Cancer Clinic in Scottsdale, AZ. For obvious reasons, 2010 was notthe best year for raising investor capital for new clinical trials. Globaleconomic struggles and funding hurdles are just a few of many examples of thebarriers to bridging the valley of death. Protein crystal growth on the space station allowed for theidentification of an improved structure of human hematopoietic prostaglandin D2synthase (HQL-79). 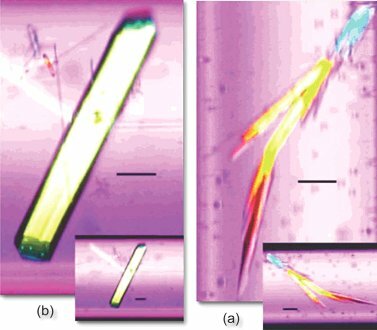 The conditions in microgravity allowed for the developmentof a slightly better crystal than previously possible on the ground. Thisimproved model provided investigators with new information on the structure ofthe enzyme. This protein inhibits an enzyme that is more active in patientswith Duchenne’s muscular dystrophy. Based on this knowledge, investigatorsdeveloped a new candidate treatment. It is now undergoing testing via animalmodels, with dramatic early success. This common and debilitating form ofmuscular dystrophy affects approximately 1 in 4,000 males, so the potentialbenefit and market are great. Barriers that could affect the eventualtranslation of the treatment to marketplace, however, include the possibility ofan ineffective candidate drug in clinical trials, despite the successful animalmodel. Likewise, if the drug has unintended effects or if intellectual propertymakes the drug difficult to bring to market, the entire project could tumbleinto the valley. good morphology. 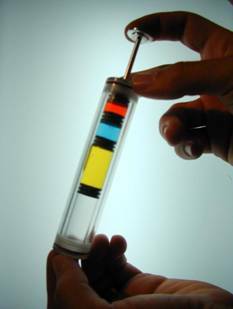 Scale bar corresponds to 100 μm. In my role as Program Scientist, I talk frequently aboutthese examples. This is because the advent of their success will validate thediscovery potential of the space station as a laboratory. Critics be warned,however, that the converse is not true. If any or all of these examples do notmake it to market, this only indicates that our society has not built the mostreliable bridge across the valley of death. The National Institutes of Health,pharmaceutical companies, and universities continually seek better bridges sothat scientific discoveries translate more directly into saving human lives. Spacestation researchers join their Earthbound colleagues on this journey to spanthe chasm for the benefit of all humanity. Today’s insight comes from Julie Robinson, chief scientist for the International Space Station. The International Space Station — the most capable laboratory ever in space — becomes fully available to scientists in 2011. Managed as a National Laboratory, the entire nation will have access for research. Early use of the space station for research shows compelling possibilities for what scientists will learn. Cellular and microbial biology is poised to make substantial advances. Already, new mechanisms of Salmonella bacteria virulence have been discovered. There are strong indicators that studies of cell differentiation and tissue formation in space could be transforming. Seeing the station’s potential, the National Institutes of Health have already selected experiments to make use of the laboratory for research that cannot be done on Earth. These studies look at broad areas of human health, including bone remodeling, immune function, and barrier functions of intestinal lining. Risking scientific whiplash to shift focus to fundamental physics, 2011 will also see the launch of the Alpha Magnetic Spectrometer. This state-of-the-art instrument, developed by hundreds of scientists around the globe, will study the formation of the universe and seek to understand dark matter itself. From the cosmos to genes in bacteria, the space station is the laboratory to watch for discoveries that could never occur at an Earth-bound lab as the era of space station utilization begins. We do a lot of interesting science on the International Space Station, but the experiments for me that are the most fun are the ones where I get to be more physically involved. Coming from a science background, that is more exciting for me. The InSPACE-2 investigation was actually a lot of fun while on orbit, because it required significant hands on activity to implement the experiment. I had to change the frequency of the electromagnet as it was sending signals and focus the cameras on different views. InSPACE-2 uses an electromagnetic field surrounding a suspension of iron particles in a liquid. Once you add the electromagnetic field, the solution can actually stiffen and form a solid or semisolid structure. This is good for potential applications as shock absorbers for suspension bridges, buildings, etc. On one occasion, because I have old eyes, I was supposed to set the electromagnet to 20 Hz, but I did not see the decimal point and set it to 2.0 Hz. The experiment was testing a theory regarding the lack of gravity to see if there were any differences compared to ground studies. Since I set up the magnetic field strengths differently than the investigators on the ground had planned, we saw some unusual patterns in the structure. It pulsated, forming moving solid strings. This was interesting for the investigators on the ground, because they had not seen this result at 2 Hz previously. After the investigator told me this, I thought we had to look into things further. Anything that they did not see on the ground that we saw in orbit was of interest in understanding the theories and how these colloidal suspensions work. After we finished our studies at 20 Hz, we went back and repeated the series at 2 Hz, based on the observed unusual differences. I volunteered some of my weekend time to go back and do this, as I enjoyed the hands on aspect of the experiment. For me, as a scientist, this was really satisfying. I think a lot of scientific discoveries are made as a result of the “I wonder why that happened,” rather than the explicit planned results you might have expected. So even though I screwed something up, it was something that the investigators learned from. The fact that I made an error was what enhanced the investigation. This type of happy accident can be true in laboratories on Earth, too. Robotically you can perform the planned procedure, but you are not going to necessarily notice any unplanned consequences. Not that humans are always the cause of the unanticipated discoveries, but more interaction can result in different observations or directions that you may take. Observations from a direct crew perspective may not necessarily be noted by investigators on the ground, too, so this is a great way to show crewmember involvement. The more astronauts understand about the objectives of an investigation, the more they can help with those identifications. There are lots of different payloads that do not work as expected once on orbit, requiring crew interactions; software may need reloaded or hardware jiggled. For instance, in my first flight, I was changing samples out for the Microencapsulation Electrostatic Processing System (MEPS) experiment, which required a huge amount of effort, so much so that I thought I would break it. I think some of the tolerances were not right, and we got the investigation completed only because of extra effort and some brute force. In fact, on the last sample they told me to push as hard as possible to get it in. Had this been done mechanically, you would not necessarily have been able to apply the extra force to complete the experiment and get all the data sets back to the investigators on the ground. There are just little things that do not work in an investigation the way you anticipate. The Advanced Diagnostic Ultrasound in Microgravity (ADUM) was another favorite investigation of mine that required human interaction. This study looked at whether you could take an untrained crewmember and guide them with ground support and live downlink. The goal was to see if astronauts could obtain viable images for investigators of various different organs; very useful for remote location medical emergencies. This was fun and enabled great interaction with the ground. It was very hands on to manipulate the ultrasound to show the right image for the investigators to see and determine if the images were usable for identification purposes. On Earth, people are now using these techniques to do ultrasounds in remote locations, from the Arctic Circle to athletic arenas. Being a researcher on the ground has also given me insight about how important it is to be able to actually modify and change your experiment in real time, based on the results you are getting. The human-in-the-loop element gives us that same capability on the International Space Station. Dr. Peggy Whitson is the Chief of the Astronaut Office and also served as Expedition 5 flight engineer and Expedition 16 commander. She holds a doctorate in biochemistry from Rice University. In today’s blog Dr. Whitson shares her thoughts and experiences as a crewmember and scientist aboard the International Space Station with the readers of A Lab Aloft. About a month ago, I received a really interesting press release from JAXA about the discovery of a new X-ray nova via the International Space Station Monitor of All-sky X‑ray Image (MAXI) instrument. One of the first things I did was contact colleagues in NASA’s Science Mission Directorate to ask what they thought of the finding. I have a background in Earth science, not space science, so I was interested in their point of view on what sounded like an exciting discovery. They were full of additional questions and wanted more information. So we contacted our Japanese associates to better understand the discovery and impacts. Of particular assistance was Masaru Matsuoka, the JAXA lead member on the MAXI team. I wanted to know if this was a new X-ray nova occurring or an existing one that was missed in previous surveys. He responded that the X-ray nova discovered by MAXI was a new X-ray source, not previously identified or catalogued. In other words, he continued, this nova occurred as an outburst in this location for the first time, which is why RIKEN named it MAXI J1659-152. Matsuoka-san added that what makes this X-ray source especially interesting is that it is the type that likely has a black hole at its center. A new find like this is made once or twice a year overall. This is the first new source discovered by MAXI. Comparison of all-sky images before and after September 25 when the nova was found. The MAXI instrument was able to locate this recent find by using two slit cameras (a gas slit camera and a solid-state camera) to continuously monitor astronomical X-ray objects. MAXI performs an entire sky scan once every rotation of the space station around the Earth. Mounted to the exterior of the KIBO module, MAXI has open access to the space environment where it identified the X-ray nova event. The information from the sky scans downloads to RIKEN, where the MAXI team disseminates data to scientists around the globe for study. This is a promising result from the operations of this instrument. The more X-ray sources we find and study, the better knowledge astronomers can gain about the nature of black holes and their distribution in the universe. On October 17, 2010, MAXI discovered yet another new X-ray nova, located in Centaurs. Since the emerging nova was dark, scientists continued to collect data while waiting for it to brighten. They announced the discovery on October 20, 2010 and named it MAXI J1409-619. The nova was confirmed as an unprecedented bright X-ray source, after NASA’s astronomical satellite, Swift, conducted an urgent target-of-opportunity observation. This nova is either a black hole or a neutron star with a companion star of a massive star existing over several ten thousands light-years. Images of areas of 10 degrees in radius around the nova MAXI J1409-619. A celestial body that was not observed on Oct. 12 shone bright on the 17th. Right ascension 14 hr. 09 min. 2 sec., Declination -61 deg. 57 min. The detailed X-ray image shot by the Swift satellite. An unknown bright new celestial body was seen in the brighter part (0.2 degrees in radius) observed by the MAXI. Scientists spend a lot of time discussing their work in proposals, manuscripts, and meetings, but Eureka! or light-bulb-going-off moments are amazingly rare. Our Nutritional Biochemistry Lab at NASA Johnson Space Center, however, was fortunate enough to have one of these moments recently. Our lab’s Eureka! moment actually started a few years ago when we submitted a proposal to look at omega-3 fatty acids as a countermeasure for the muscle loss caused by space flight. Omega-3 fatty acids have been shown to help stop muscle loss in cancer patients; we believed the sub-cellular mechanisms of the two types of muscle loss are similar. In theory, if it works for cancer, it should work for space travelers. Although that proposal was well scored, funding was short that year and our experiment did not make the cut. The data suggesting that omega-3 fatty acids would help slow or stop muscle loss was pretty convincing, but some softer evidence hinted that omega-3 fatty acids might also help slow bone loss. We proceeded to do a cell culture study—long story short, we added omega-3 fatty acids to bone cells and it suppressed the activation of cells that break down bone; bone breakdown is the process that is accelerated during spaceflight and during disuse here on Earth. This was pretty exciting in and of itself, but not the moment of epiphany. The Eureka! came when we were in a meeting reviewing another bone loss countermeasure that was tested during bed rest. Unfortunately, despite high hopes going into the study, this method was not working. As I rolled this around in my head, it seemed to me that nothing to date had worked at slowing bone loss. We had tried exercise and other physical countermeasures with limited success and, although drugs are available, there is not a drug out there without side effects. It was during this reflection that the light bulb went on. Eureka! I realized that our bed rest studies had included a menu that was pretty loaded with fish, which is a great source of omega-3 fatty acids. This was done to help increase the vitamin D content of the diet, a very important factor. As I thought of ways to investigate my hypothesis, I realized I had some challenges to face in gaining specific data on omega-3 fatty acid intake. It is not easy to find volunteers to literally spend a few months in bed, let alone subjects who are willing to participate in the bed rest and also forego eating fish. Driving home that night, I called my colleague Dr. Sara Zwart and suggested we look at the omega-3 fatty acid intake in the existing bed rest subjects and compare it to the bone data from the same subjects. The next morning, Sara had the graph, which clearly showed a relationship between omega-3 fatty acids and N-telopeptide—a marker of bone breakdown that appears in the urine. Specifically, and statistically significantly, the more omega-3 fatty acids the subjects ate, the less bone breakdown marker they excreted, which was pretty cool! We then took the next logical step, to see if the diet of astronauts was related to their bone breakdown. 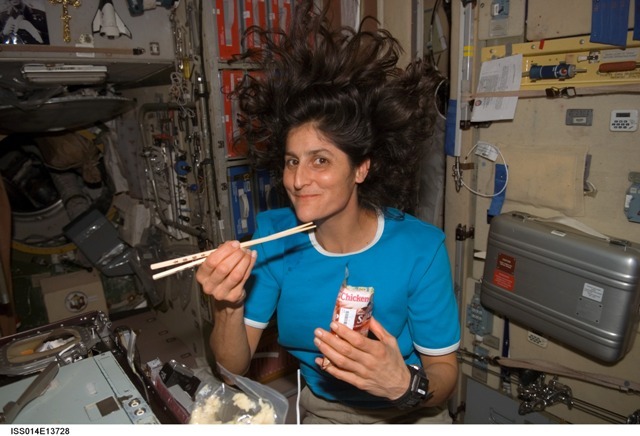 We track dietary intake of astronauts during space flight using a food frequency questionnaire or FFQ. This tool monitors the intake of seven key nutrients: energy, fluid, protein, calcium, iron, sodium, potassium. The FFQ is designed to measure only these specific things, so if we wanted to measure anything else, we would typically have to modify how we grouped the foods in the questionnaire. Instead of redesigning the tool, we took a leap and looked at fish intake in the diet of the International Space Station crewmembers. Given that we did not have the detailed omega-3 fatty acid content of all space station foods, and given that we did not sort out the fish by those rich or poor in omega-3 fatty acid content, this was admittedly a stretch. When we compared the relationship between reported fish intake in crewmembers and their bone loss after flight, however, we found another significant relationship. Those who ate more fish lost less bone. This was awesome stuff! It was one of those rare times in a scientist’s career when unrelated pieces of information actually built into a complete story. This story did not end, though, with these findings. What we had at this stage was what is called correlational evidence. The two factors—fish intake and bone loss—were related. This does not directly prove a causal relationship, however, and could be nothing more than coincidence or indirect effect. For example, those who ate more fish probably ate less meat, which we also conjecture is bad for bone health. What we need now is a controlled study, where we track and control intakes throughout a space mission, with one group eating a high omega-3 fatty acid diet and others consuming a low or “control” omega-3 diet. By comparing the data from such a study, we can detect differences in bone loss. We have submitted this proposal and hope an opportunity arises in the near future to carry out the experiment. This research not only has clear benefits for astronauts, but also significant implications for those of us on Earth. These types of relationships—between fish and bone—have been observed. Given the much slower rate of bone loss on Earth, however, makes effects more difficult to pinpoint. Microgravity research can amplify the impacts, providing new knowledge that may benefit those suffering from bone loss. This is just another example of where the space station provides an out-of-this-world platform for human research! while on orbit aboard the International Space Station. 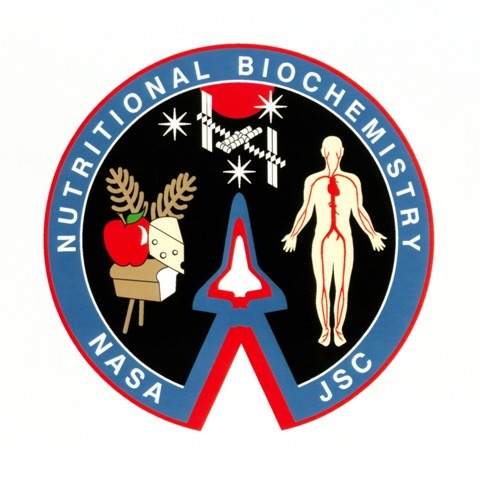 Dr. Scott Smith and his colleague Dr. Sara Zwart lead NASA’s Nutritional Biochemistry Lab at Johnson Space Center. The research discussed above was published in the Journal of Bone and Mineral Research (Volume 25, pages 1,049-57, 2010). 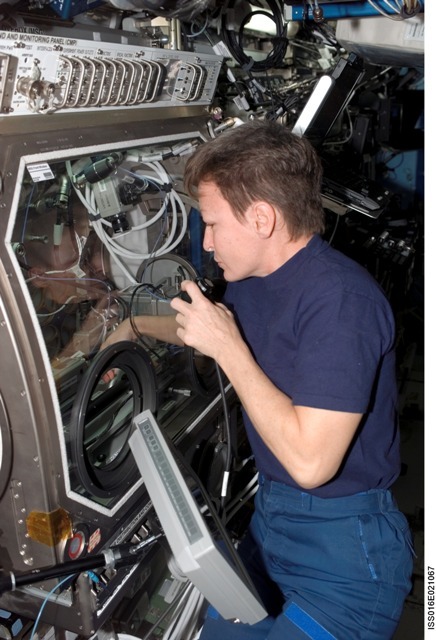 In addition to ground-research studies, they lead two space station experiments: Nutritional Status Assessment and Pro K, which investigate the roles of animal protein and potassium in mitigating bone loss. In today’s blog Dr. Smith shares his thoughts and experiences as a scientist with the readers of A Lab Aloft.